On 7 August 1919, the Erzurum Congress concluded its work with the election of a nine-member representative to exercise all powers on its behalf. Now the representatives of the congress and its chairman waited for a large task. So that the spark of the Erzurum Congress did not go out, it was brought to Sivas to make national salvation safer! For this reason Mustafa Kemal Pasha managed to bring the Erzurum Congress, which was called to the fate of the eastern provinces, to the Sivas Congress in order to address the whole country from there and to regain the area of the country. In the days of preparation for the Sivas Congress, the conditions of the severe ceasefire continued in the country with all its bitterness. The unjust and cruel acts of the Mondros Armistice against the Turkish nation, the occupation of Izmir by the Greeks and the invasion of Anatolia by the occupiers invaded various cities. All this was difficult for the population. It was in this atmosphere that Mustafa Kemal Pasha came from Erzurum to Sivas on September 2, 1919 to attend the Sivas Congress with representatives. Sivas greeted the leader of the National revolution with unprecedented demonstrations and enthusiastic joy. On September 4, 1919, the Sivas Congress was held with 38 representatives in the hall of a large building that served as a grammar school. Mustafa Kemal Pasha was elected as the President in the first session. The Congress lasted eight days and ended on 11 September 1919 with the publication of a statement following the election of the delegation. On September 4, 1919, the Sivas Congress was held with 38 representatives in the hall of a large building that served as a grammar school. 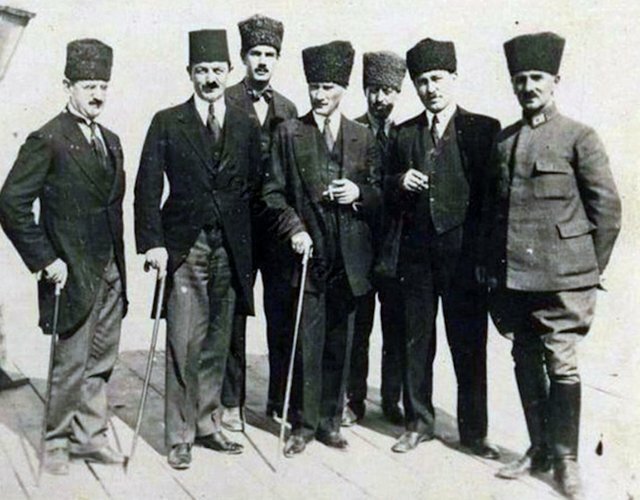 Mustafa Kemal Pasha was elected President in the first session. The Congress lasted eight days and ended on September 11, 1919 with the publication of a statement after the election of the representatives. The meeting of such an important congress, which represented the entire country after the Erzurum Congress in Sivas, was particularly related to the strategic status of the city. This city, located in the middle of Anatolia, was not occupied despite the presence of some occupying states. In terms of traffic, Sivas was an intersection of Anatolian streets: There were connections to the different Anatolian cities and provinces, as it could only be on those days. In addition to all these advantages, the Sivas branch of the Defence of Rights Society was well organized in the city. The Sivas Congress, which took place under the harsh conditions of the country, was a national congress gathered immediately after the call of Mustafa Kemal. Of the 38 members of the Congress, 32 were from the Western and Central Anatolian provinces, and 6 were members of the representatives. The representatives representing the Eastern provinces and representatives from the Western and Central Anatolian provinces therefore gave the Sivas Congress a broad and unrestricted presence on behalf of the whole country. As a historical fact it is important to note that the government of Istanbul and some of its lackeys tried, as at the Erzurum Congress, to prevent the meeting of the Sivas Congress with all means. For this reason, representatives of the governorship could not leave Ankara. Also some representatives from other cities had their problems. Representatives elected from some provinces were also prevented from making their way to sivas because of the same pressure, so that they could not participate in the Congress. In order not to convene the Sivas Congress, the French gendarmerie inspector Brüno, who was in Sivas, put pressure on them. In consultation with the Governor Reşit Pasha, he said that Sivas would be attacked and the Congress would be dissolved if such a Congress took place. The British also threatened to occupy Sivas over Samsun. But all the pressure and fear had no effect. The determination of Mustafa Kemal Pasha gave much strength to the people. The Istanbul government tried to arrest Mustafa Kemal with all its might on the days of the Sivas Congress, as it did during the Erzurum Congress. With telegrams sent to almost every governor of Anatolia, Mustafa Kemal was to be arrested and brought to Istanbul at any cost. In order to achieve this, special governor's offices were appointed and high prices promised. But none of the rulers had the courage to meet the demands of the Istanbul government within the framework of the forthcoming national will and air. Mustafa Kemal Atatürk was a great leader of turkey .who was the founder of turkey.i salute mustafa kamal. That is when you hold real power when the authorities actually have no power and are ignored. He certainly had the people power. You just got a 1.82% upvote from SteemPlus! Your UA account score is currently 4.722 which ranks you at #1530 across all Steem accounts. In our last Algorithmic Curation Round, consisting of 368 contributions, your post is ranked at #30.